Regret that tattoo you got when you were 15/drunk/really into Greenday/head over heels in love with the boy next door? We know that feeling, and we know what it’s like to just really need something gone from your body and your mind. Picosure can help your tattoo fade away forever. Tattoos are permanent because the motorised machine they’re applied with inserts the ink under the skin, a few layers under the surface. This is why a tattoo can’t simply be scrubbed off, or wear away. While Q-switch lasers were previously seen as the gold standard of tattoo removal, the new kid on the block – PicoSure – can now lay claim to that mantle. Instead of using heat to destroy the ink particles that make up your tattoo, PicoSure uses super-short but powerful pulses to shatter your tattoo into molecules small enough to be removed by the body’s natural systems. 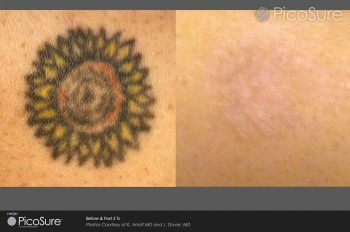 The pulses are much more powerful than a standard Q-switch laser, making your tattoo removal much quicker and – thanks to the lack of heat required – much less likely to scar. As well as being quicker, PicoSure can also remove tattoos that have previously been too stubborn to move; those with a lot of green and blue ink, for example, or ink that’s been there for a long time. If you’re tempted to wave ta-ta to your tattoo with PicoSure, call Pulse Light Clinic today for a consultation. Find out more about the PicoSure, by clicking this page.